The Dino Baffetti Tex-Mex II/34 arrived on Thursday! Very exciting! I had intended to do an internal examination of the box, a la Owen Woods or Daddy Long Les, but I found I couldn’t bear to take a screw driver to it, not even to remove the grill. I’m made of less stern stuff than that, it seems. Big one! Playing a three row is different from playing two or two-and-a-half row or even two-row-plus-accidentals. Possibly this is obvious. The three row quint box can do different things that I don’t yet know how to do. New frontiers! The two row repertoire works just fine on this one. Even if it is obvious that playing up-and-down the rows is not what it was built to do, everything I’ve been learning for the last 15 years is essentially transferable! At melodeon.net there is a recurring discussion about stepped keyboards vs. flat keyboards. Playing a flat keyboard for the first time in years has made no difference to me. Even though this is an F/Bb/Eb box (which is exactly what I was after) I’m choosing to name it as G/C/F and recognize that it’s a transposing instrument. All of the sheet music and tab is for G/C/F, so this seems simplest. It sounds AMAZING. Essentially, as one colleague mentioned, it’s a clone of a Hohner Corona, done to a absurdly high level of quality. The sound is so very sweet. And the touch is effortless. 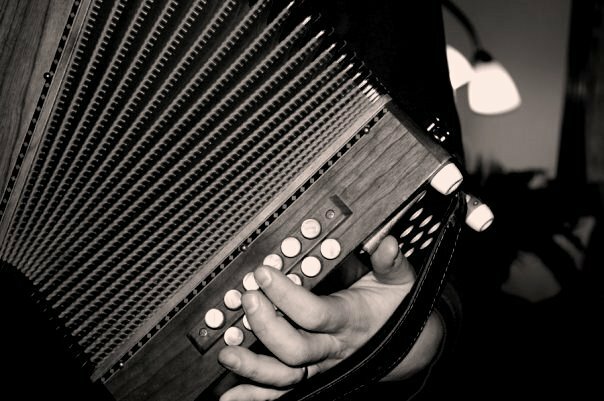 I do have fond feelings for Hohner accordions, but this is a cut above. It is a little silly that with five rows of box to my name, I still don’t have a D row. What sort of psychological block am I dealing with? Is it PTSD from the Minneapolis Irish sessions? 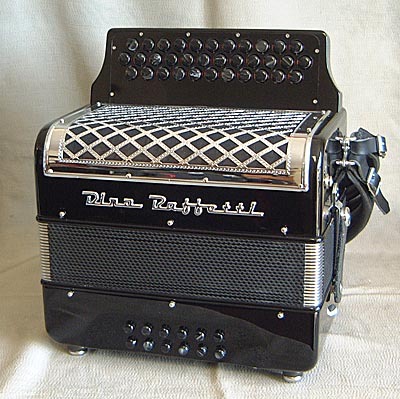 Here are three videos with the Baffetti. The first is a hanter dro written by Sylvain Piron. The second is another hanter dro, traditional, that I learned from Steve Gruverman. The third is a Breton March, traditional, that I learned from the playing of Daniel Thonon. Another Breton tune, learned from clarinetist Steve Gruverman (tune finder extraordinaire). The hanter dro is that rare thing, an intimate line dance. Moving to the 3/2 meter, the dancers snake around the floor, spiraling, encircling, ensorceling the musicians. I try to embody the apparent Breton motto — “repetition is the soul of wit” — by matching an entrancing melody with a sweet, innocent harmony. Against current practice, I am a big fan of 3rds in my chords. The Theme of the Month over on Melodeon.net is Tunes from Brittany and I urge anyone who enjoys that sort of thing to head over for a listen. The tunes and videos being posted are wonderful. Also, Andy of Vermont recently posted a Yann Dour tune played on his 3-row Castagnari Jacky. Check it out.